Interested in learning more about Hawaiian wedding traditions? If so, you’ve come to the right place. In Hawaii, a wedding, or ho’ao pa’a, celebrates two lives joining together in a commitment of love. Modern Hawaiian weddings have meshed with western traditions. But wherever the location, there still remains a fair amount of traditional Hawaiian customs in wedding ceremonies in Hawaii. A kahu (a local minister or holy man) often officiates the ceremony. This person escorts the groom to the head of the altar, while singing a mele or chant. A circle of flowers usually covers the alter where the bride and groom stand. The groom traditionally wears a white shirt and light pants with a colorful sash at his waist. Then the mothers of the bridge and groom come down the aisle with their escorts, followed by the bridal party. Often the blowing of a conch shell (or pu) announces the bridal entry. It symbolizes the call of the sea, earth, air and other elements as witness to the ceremony. The bride then enters, dressed in a flowing white gown and wearing a haku or halo of flowers. Both the bride and the groom wear leis and exchange them to symbolically represent their love. Traditionally, the groom wears a maile lei. While bride wears a pikake lei. The parents of the bride and groom traditionally give leis to their children. Also, the bride and groom give leis to their parents-in-law as well as to those in the bridal party. The playing of a ukulele or slack key guitar usually accompanies the ceremony. One of the most popular songs to hear at a wedding is the classic Hawaiian Wedding Song, Ke Kali Nei Au or Waiting for Thee. Charles E. King originally composed this song in 1926 for the operetta, Prince of Hawaii. And it is a favorite at many Hawaiian weddings. The bride and groom then exchange vows and rings. The Hawaiian tradition of the rings often includes the kahu reciting a chant while filling a koa wood bowl with water. The kahu then dips a ti leaf into the water and then sprinkles the water over the rings. This symbolizes strength, prosperity and health for the couple. At the end of the ceremony, the kahu blesses the couple and prays for love and protection. For Hawaiians, nature is an important aspect of their heritage. It is no surprise many couples use their connection to the earth to bring significance to their wedding. Some couples take two different colors of sand and pour them together. This is symbolic of mixed lives that cannot be separated. Others leave rocks wrapped in ti leaf on the altar as a commemoration of the ceremony. Other traditions incorporate water rituals, whether by collecting fresh water or by sprinkling it over the couples. Much like western weddings, a celebratory feast follows the ceremony. Here, there is music and food that make the evening an enchanting night to remember. Hawaiian wedding receptions may include traditional dishes like poi, laulau, kalua pig and poke. They can also include a wide variety of local fruits such as mango, pineapple, guava, lychee and banana. Desserts vary from haupia to lilikoi cake topped with fresh Hawaiian flowers. With delectable dishes, flowers and cool breezes, attending a Hawaiian wedding is a perfect way to experience the Aloha spirit. 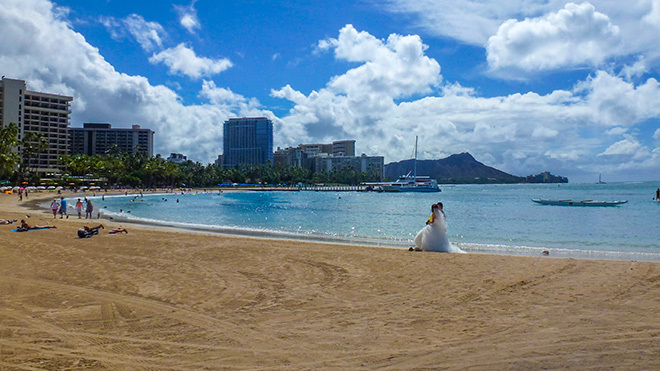 For more information on memorable places to get married in Hawaii, check out our Hawaii Weddings page. Here, you can get ideas on where to get married on each of the Hawaiian Islands. If you’ve already planned your wedding, but need honeymoon arrangements, check out our Honeymoon in Hawaii page.